The new “Grief Support Network” app was launched by the online grief support non-profit My Grief Angels just in time for what can be one of the most difficult times of the year, the holidays. For many of the 10 million people in the United States and 250 million worldwide that will grieve alone this year, the memory of past celebrations with their loved ones can often trigger painful grief attacks. This new free app can help. For anyone who doesn’t want to grieve alone, the “Grief Network Support” app lets you connect locally with other people who are grieving anytime, anywhere. Individuals, families, friends, co-workers or any group can create their own local community support networks and the app’s proximity-based live chat feature also lets users see who from their network is nearby and available to chat 24/7. The app’s “Angels Wall” lets users post messages seeking the support of others who have faced a similar loss. One of the first postings on the “Grief Support Network” was from a grieving daughter in Boston who reached out to others who had parents who were victims of early onset Alzheimer’s. In a national survey conducted by My Grief Angels, “Over 80% of the respondents did not feel prepared to deal with the death of their loved one” and the vast majority of responders also believe that more needs to be done to educate people on grief and the impact it can have on our health and our families. That is why the new app includes a Grief Health feature that can help educate users by providing links to articles and information sources. The free app also provides users with access to selections of calming videos, photos and sounds. The “Grief Support Network” app is now available through Amazon Apps, Google Play Apps and soon in iTunes Apps. Read the story here. In the past, every funeral followed pretty much the same formula. But if no two people are alike, why should their funerals be the same? A funeral can be as special and as memorable as the individual being honored. A unique celebration commemorates the deceased and helps bring comfort to loved ones during a time of grief. So, how can you plan a creative funeral service that stands out? Here are five ideas for making a celebration of life truly unique and special for everyone involved. Ditch Traditional Dress Black has been the go-to for funeral attire for hundreds of years. In fact, the Victorian Era had a strict dress code for mourners depending on their relationship to the deceased. Our clothing has changed drastically since hoop skirts and top hats, so why shouldn’t the attire worn at funerals change too? Consider the personal style, hobbies, and interests of the person and incorporate them in a way that best reflects the life of the one being honored. For example, if you are planning ahead for your own funeral and you are an avid sports fan, you could request your guests to wear t-shirts or jerseys featuring your favorite team (this might be the only time you can get your Red Sox co-worker to put on a Yankees tee). One family asked their friends and relatives to dress in superhero apparel at their five-year-old son’s funeral. The pallbearers were dressed up as Spiderman, Superman, Batman, Iron Man, The Hulk, and Thor in honor of the young boy’s favorite superheroes. Essentially, a funeral is an event to celebrate a special life. Whether that means it’s a black tie affair or a celebration of your favorite color, team, or movie is completely up to you. Make your funeral pawsome by adding a fuzzy friend to the guest list. Studies show spending time with animals can reduce stress hormones and boost oxytocin. Basically, animals make people feel happier. Ballard-Durand Funeral Home and Cremation Services in New York have found this fact to be true with their newest employee, Lulu, the golden-doodle. Lulu is a trained therapy dog who is always there to comfort, listen, and even pray with guests during their time of need. “I’ve had kids lie with her on the floor and put little flower buds in her hair to try to dress her up. I overheard one little girl, who was there for her grandfather’s service, say to Lulu that she missed her grandpa. She was just talking to the dog because she felt that Lulu’s purpose was to listen to her.” said Lulu’s “dad”/Funeral Director. If you’re interested in having a therapy dog at your next funeral event, ask your local funeral home if they offer such services or if they know of any therapy dogs in the area who can attend the visitation or family gathering. Groups like Therapy Dog International (TDI) may be able to connect your funeral home with a dog and handler. Guests of all ages can benefit from a little puppy love during an especially stressful and difficult time. Food has been a part of wakes and funerals for as long as formal, black attire—but comfort food never goes out of style. Consider serving appetizers, refreshments, or a full meal to guests who attend the visitation or gathering. It can be as elaborate or as simple as you like. Harry Ewell, a man from Massachusetts, owned his own ice cream truck for years. His old truck led the funeral procession and his guests were treated to free ice cream and popsicles at the graveside. One mother celebrated her father’s death by having an ice cream bar after his service. 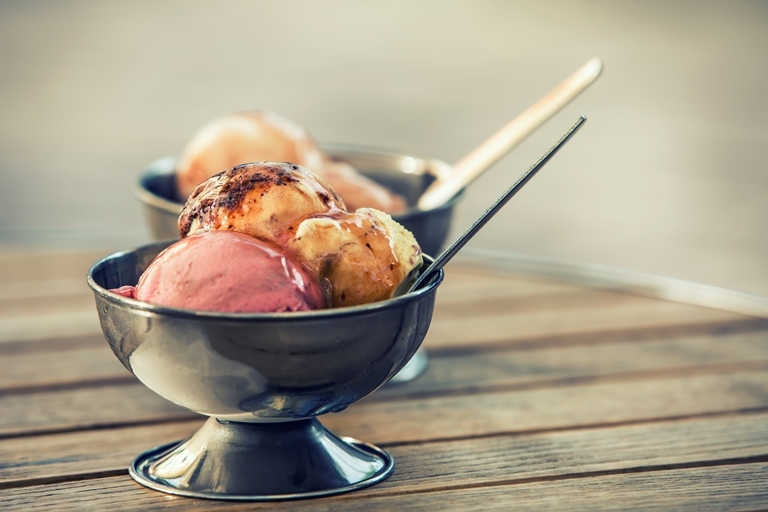 “My father loved ice cream and enjoyed a large bowl before bed for most of his life. In fact, growing up, we had a freezer just for ice cream in the garage. My dad always said, “There’s always room for ice cream, it melts and fills in the cracks.” Though ice cream is clearly a favorite, you don’t have to limit yourself. Cosmetics queen, Estée Lauder, served marshmallows on trays at her funeral. Did you love grilling? Maybe your guests would like to hold a memorial cookout in your honor. No matter what type of food it is, guests will appreciate the option to grab a bite of comfort food during a difficult time. An important part of any ceremony is when those who are gathered are allowed to participate in some special way. Giving funeral attendees a role in the celebration of life helps loved ones process their emotions and share a special experience together. For example, a butterfly or dove release is a meaningful way to cope with grief at a funeral. These beautiful creatures are set free by guests at the service to symbolize letting go of sadness and embracing the hope of a new beginning. 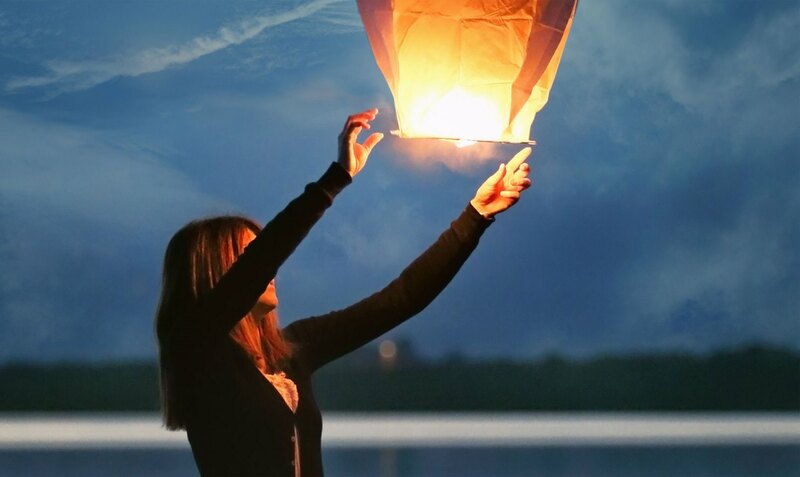 A balloon or paper lantern release is another way of encouraging guest participation. Guests can write a message on the balloon or lantern, or attach a note to the string of a balloon and release it during a special ceremony. A memory table can also be great for guests to contribute to. Guests could also bring photos, mementos, and treasured belongings that have significant meaning for the person who has passed away. All of these objects can be displayed on a table for others to view during the service. Guests can also be given the opportunity to write a condolence note or to share their favorite memory on a notecard or in memory book. Later, the family will be able to enjoy looking over and reading these memories—sometimes stories they have never heard before! As you plan a service, think about how you’d like your family and friends to participate in the event so that you can all share a meaningful memory together. People give their time, emotional support, and sometimes even financial support when they attend a funeral. What a better way to say “thank you” than by giving them a little gift in appreciation for attending. People are celebrating you and what made you unique as a person. Your gift should signify something special about you so your guests can feel like they are taking a bit of who you are home with them. If you loved gardening, then send your friends home with a package of seeds or a small potted plant. Every time they see the beautiful plant sprout up they will think of the lovely life you lived. Maybe you were known for being a coffee drinker. Customize a mug that holds a package of your favorite blend inside. What better way to honor a loved one than to let their legacy live on through a parting gift to friends and family? As you can see, there are various elements that can be added to a service to help reflect the life of the one who died. Adding personal touches can turn a funeral into a celebration that brings special comfort and healing to the whole family.